Sargents Purchase: During the afternoon and evening of Sunday, June 3, 2018, rescue personnel from multiple agencies teamed up to rescue a pair of hikers who had become stranded in treacherous terrain on the face of Huntington Ravine, Mount Washington. At approximately 1:00 PM, New Hampshire Fish and Game Department Conservation Officers received a call from a 911 dispatcher indicating that two hikers had gotten lost off trail on Mount Washington and were in need of assistance. Upon callback, authorities learned that Daniel Rueda, 27, of Warwick, Rhode Island and Christopher Petteruto, 21, of Coventry, Rhode Island were stranded in steep terrain at an unknown location in the area of Huntington Ravine. The hikers were able to give a description of the area but could not provide specific information, as they had not been there before. 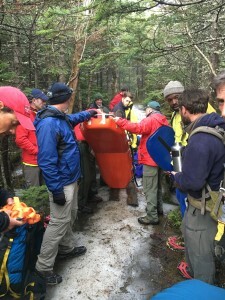 Following the initial call, Conservation Officers reached out to volunteers from the Appalachian Mountain Club (AMC), who responded from around the mountain to search for the hikers. Over the next two hours, distant voice contact was made but an exact location could not be pinpointed. 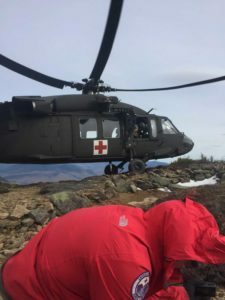 With the afternoon turning to evening, additional search and rescue teams were formed, consisting of volunteers from Androscoggin Valley Search and Rescue (AVSAR), Mountain Rescue Service (MRS) and the US Forest Service. Additional information eventually surfaced, helping crews to focus their attention on the northeast side of the ravine in an area known as Henderson’s Buttress. By 6:00 PM, crews were still working to reach the stranded individuals. Temperatures had gone from the 50’s to the high 30’s, and the hikers began to report through 911 (via cell phone) that they were becoming very cold and physically deteriorating. The hikers had insufficient gear to stay warm, which applied additional pressures to the volunteers to make it to them before the situation went from bad to worse. At 7:27 PM, rescue crews successfully reached the hikers at a location approximately 1000 feet off of the Huntington Ravine Trail. The hikers were located in an area of ledge, making it difficult to move either up or down. The hikers were subsequently assessed and provided with warm clothing, water and food. 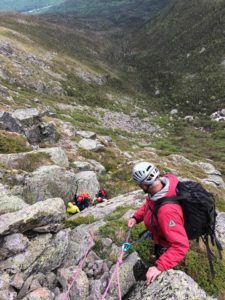 Once warm, the two were able to hike and climb with the rescue team back out to the Huntington Ravine Trail and eventually up Mount Washington to the Alpine Garden. The hikers were then lead to the Mount Washington Auto Road where they arrived safely shortly after 9:00 PM. Following the evacuation, the hikers were checked by members of Gorham Ambulance before leaving in their own vehicle. Conservation Officers would like to remind all outdoor enthusiasts to always be prepared for the unexpected, even on really nice days. This day started out great for the hikers in question and then ended in a six hour sit with temperatures that nearly hit the freezing mark. The forecast for the coming week on Mount Washington includes a “wintery mix” that will likely take the mountain from spring right back into winter.